FERMA’s European Risk and Insurance Report shows that many insurance risk and enterprise risk managers are close to the decision-making heart of their organisations. Eighty-four (84%) of insurance risk and enterprise risk managers report to the board or top management; nearly half of them (45%) several times a year. Heads of insurance or risk management most commonly report to: the CFO (33% for insurance and 24% risk), to the CEO (12% and 17%) and to the board (12% and 18%). Many respondents have regular, close collaboration with other functions. Risk managers are involved in discussions on: ethics, compliance and legal issues (57%); internal audit and control (55%); mergers and acquisitions (52%), and strategic business planning (35%). Respondents were asked to name the top 10 risks that “keep the CEO awake at night” and how well they were mitigated. For six of the ten top risks, they report a low level of satisfaction with the mitigation. These risks are: political: government intervention, legal and regulatory changes; compliance with regulation and legislation; competition; economic conditions; market strategy and human resources. For reputation and brand; planning and execution of strategy and debt/cash flow, there is a medium level of satisfaction with the mitigation. Only for quality issues, such as design, safety and liability of products and services, is it high. Who are the insurance and risk managers? The report reveals that the typical risk and insurance manager in Europe is male, aged between 45 and 55 and earns between €100 000 and €120 000 a year. He works at the head office of a very large company based in a European country. He has been in his role for between three and 10 years but he has been in the sector for more than 10 years. He probably has a specific qualification in insurance or risk management. The level of insurance buying sophistication continues to rise, the report shows. The use of captives is continuing to grow, especially for non-traditional lines. The number of international programmes, even on less mature lines of business, is rising, and buyers are optimising their programme structures, particularly in terms of retentions and limits. Of 39% of the respondents who own or use a captive, many expect to use it more over the next two years: 39% for non-traditional lines of cover and 33% for traditional lines. Only 15% of respondents use enterprise risk management (ERM) tools such as risk financing optimisation to guide their insurance purchasing decisions. Another significant trend which the FERMA report reveals is that insurance buying behaviours in Europe tend to depend on budget restraints and rules of thumb. “While tried and tested by many risk managers, this way of thinking could pose significant problems for the management of emerging risks such as cyber and environmental liabilities,” says Michel Dennery. 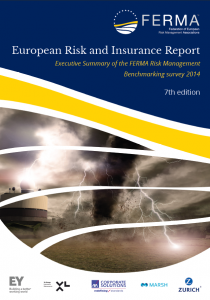 The FERMA Risk Management Benchmarking Survey has taken place every two years since 2002; this is the seventh edition.